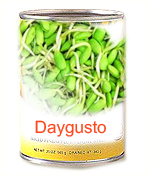 Canned bean Sprout in Brine 24/ 8 Oz. Whole 140 g. 200 g.
24/15 Oz. Whole 210 g. 410 g.
6/A10 Whole 1,500 g. 2,950 g.